Thomas & Friends. My First Words Sticker Book Egmont Books Join Thomas as he helps toddlers practise easy first words in this colourful sticker book. It's packed with sticker scenes, simple activities, fun-filled pictures of favourite engine friends and big bright stickers for little hands. Thomas & Friends is a great way to pass on the tradition of Thomas to early readers. Children aged 2 and up will love meeting classic characters such as Percy, James, Gordon, and Toby down on The Fat Controller's railway. Thomas has been teaching children lessons about life and friendship for over 70 years. He ranks alongside other beloved character such as Paddington Bear, Winnie-the-Pooh and Peter Rabbit as an essential part of our literary heritage. Аннотация к книге "Thomas & Friends. My First Words Sticker Book"
Join Thomas as he helps toddlers practise easy first words in this colourful sticker book. It's packed with sticker scenes, simple activities, fun-filled pictures of favourite engine friends and big bright stickers for little hands. Thomas & Friends is a great way to pass on the tradition of Thomas to early readers. Children aged 2 and up will love meeting classic characters such as Percy, James, Gordon, and Toby down on The Fat Controller's railway. Книжка большого формата. Обложка тоненькая, как и сама книжка. Листы белые, печать ясная. Присутствуют цветные, забавные иллюстрации, плюс наклейки. Для детей, изучающих английский язык. Похожие на "Thomas & Friends. 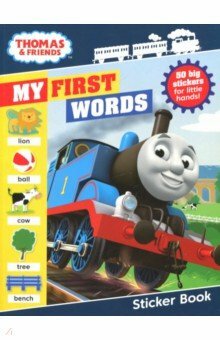 My First Words Sticker Book"
Если вы обнаружили ошибку в описании книги "Thomas & Friends. My First Words Sticker Book" (автор Jacqui Butler), пишите об этом в сообщении об ошибке. Спасибо!